Lighting can illuminate your pond to accent the waterfall and the fountain, or show off the plants and fish you have in your pond! These Solar Walk Lights will add a touch of elegance to your outdoor landscape. Set of 10 lights offers flexibility to customize your design. Finished in a lovely Pearl Grey, the lights will provide many seasons of enjoyment. Add style and enhance the beauty of your home and landscape with this mini spotlight kit with multi-colour LED. UV protected black paint finish and heat resistant lens provide long life. 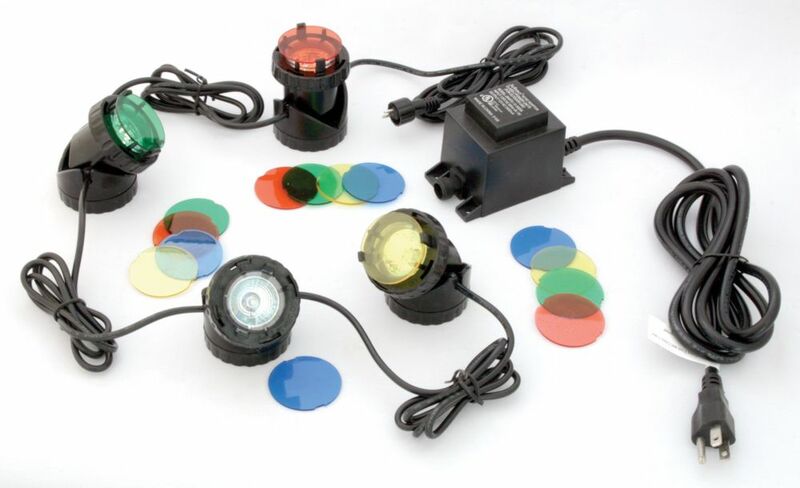 This box includes 4 spotlights, wire, transformer and remote control. Unique, low-voltage pathlight spreads light horizontally across paths or sidewalks. Provides excellent illumination from a very small and discreet source. Heavy-duty, cast bronze construction withstands virtually any conditions. Pond Glo 4-Piece Pond Lighting with Transformer Lighting can illuminate your pond to accent the waterfall and the fountain, or show off the plants and fish you have in your pond!